Need to register? Click here. Use Dorner’s Comp Code 86S31 for free registration. Already registered? Add Dorner to your Show Schedule! There are only 4 weeks left until PACK EXPO 2015! While we’re putting the finishing touches on the conveyors we’re bringing to the show, we want to give you a sneak peek! Here are two conveyors of the conveyors we will be displaying in Booth C-1847. The 1100 Series miniature belt conveyors are our smallest conveyors, and at ¾” frame height, they have the lowest profile in North America. These conveyors are designed for small or lightweight part handling and can easily fit inside machinery or other equipment. The 1100 Series is Class 100 cleanroom certified, which makes them ideal for use in medical and pharmaceutical applications. 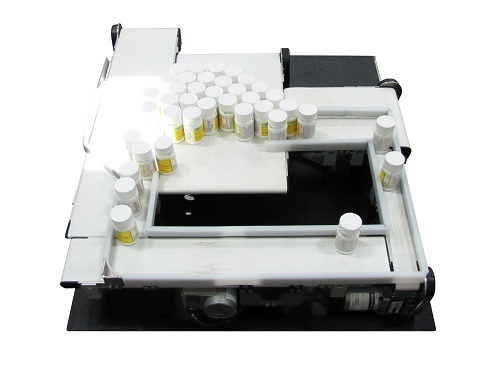 The 7600 Series ULTIMATE conveyor is designed to meet strict sanitary requirements. They are ideal for the most demanding environments including food processing or ready-to-eat foods, dairy and other environments which require high-pressure washdowns. Learn more about our sanitary line of conveyors.